LA Unified is poised to consider using district property to house homeless students and their families. Kelly Gonez, who authored the resolution that’s up for a school board vote Tuesday, said that to her knowledge, this would be a first for the district. Build or convert buildings to create temporary or permanent housing. There are no identified locations at this point, but possibilities could include schools, offices and parking lots. The resolution proposes using funds from Proposition HHH, a bond measure voters approved in 2016 that granted the county $1.2 billion to aid the homeless, including building affordable housing. There are between 16,200 and 21,000 homeless students in LA Unified, depending on who’s counting. The definition of “homeless” varies, but often includes those residing in shelters or cars, doubling up with other families or living on the street. Last year, the number of homeless students in LA Unified spiked 50 percent from the previous year as the district doubled its staff who work with the homeless from 14 to 29 people. Homelessness has far-reaching consequences on academic achievement: Research shows these students are eight times more likely than their peers to repeat a grade and twice as likely to score lower on standardized tests. About 23 percent of homeless youth in LA Unified also miss 10 percent or more of the school year — nearly twice the district average, according to the California Department of Education. Housing initiatives for homeless students in San Francisco and Dallas Unified School District in Texas are serving as inspiration, she said. Apart from housing, the resolution also calls for a review of the 12-year-old Homeless Education Program, and asks the district to examine the possibility of adding counselors — Gonez said there are fewer than 100 in that program now. It seeks to bolster professional development opportunities for schools’ “homeless liaisons” as well. This liaison is oftentimes a staff member, such as a teacher, who is volunteering to be a resource for his or her school’s homeless students. 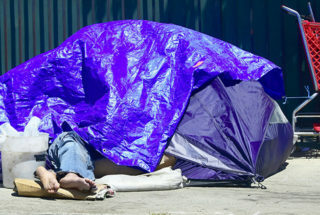 Los Angeles is in the midst of building new housing for the homeless — there are an estimated 53,000 homeless people in Los Angeles County — with Proposition HHH funds. New approaches include small backyard homes and apartments made from shipping containers. But demand for affordable housing in LA’s red-hot market still well exceeds supply: The Los Angeles Times reported that 32,000 units geared toward low-income families would need to be built by 2021 to accommodate the affordable housing shortage. And Proposition HHH’s initial goal of 10,000 units over 10 years is already appearing untenable. Affordable housing is also sparking public opposition. In neighborhoods such as Venice, residents worry adding temporary shelters will attract more homeless people to the area. In San Jose Unified School District, which is entertaining the idea of using nine district-owned properties to build new affordable units for teachers and other school employees, some residents fear development would lower home values, ruin neighborhood aesthetic and worsen traffic. Board members García and Melvoin will introduce a separate resolution Tuesday that — like San Jose — would consider developing “affordable workforce housing” for eligible district employees, such as teacher assistants and cafeteria workers. That resolution is scheduled to be voted on at the board’s Dec. 11 meeting. For the resolution to pass, four of the six board members must approve it. The seventh seat on the board has been vacant since District 5 board member Ref Rodríguez stepped down in July after pleading guilty to money-laundering charges related to his 2015 election. If approved, Beutner would have 180 days to submit a report or presentation. Tuesday’s regular board meeting starts at 1 p.m. at 333 South Beaudry Ave. in the Board Room.